Veesible at latitudes atween +85° an −75°. 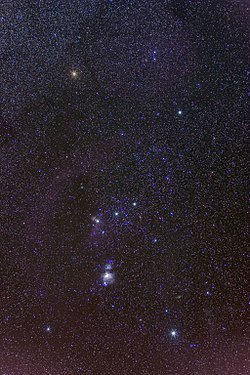 Orion, whiles cried The Hunter, is a kenspeckle constellation, aiblins ane o the lairgest an maist weel kent. Its gesserant starns is fund on the celestial equator an can be seen athort the warld. The Keengs' ellwand o starns - three starns o middlin brichtness in the mids o this constellation - maks this constellation easy tae find. Frae mid-northren latitudes, Orion is veesible in the e'enin frae October tae early Januar an in the mornin frae late Julie tae November. Orion swuird is aften kent as Saunt Peter's staff. This page wis last eeditit on 2 Mairch 2014, at 02:02.